In their attempt to assassinate girl-activist, Malala Yousufzai, has the Taliban inadvertently rescued the narrative of violence against women? Just as in other patriarchal societies, violence against women (VAW) in Pakistan is endemic and cuts across all classes and ethnicities. Men of all ideological bents instrumentalise the political economy of VAW as a highly lucrative and politically successful strategy of maintaining material supremacy and social power. Over the last three decades, Pakistan has been at the receiving end of donor-assisted campaigns and gender-empowerment awareness programmes on violence. These projects were sub-contracted to NGOs that had been set up by feminists who themselves, in the 1980s, had been involved in direct action activism on cases of violence. With the sponsorship of international development assistance, “women’s NGOs” have steadily embraced the concept and become advocates of linking VAW to neo-liberal development agendas. This has re-directed analysis and activism from its primary focus on survivors and perpetrators of violence. Instead, increasing attention and funding has led to a change that is more in tune with the UN and donor-preferred approach known as ‘Gender-Based Violence’ (GBV). The shift has meant more than a replacement of acronyms. The impetus of both, VAW and GBV activism, may be the overlapping theme of violence but for the latter, the emphasis is much more on the context and sites where violence is ‘gendered’ and sustained. The long-term developmental aim of GBV is to change power inequalities between men and women in society. Exacerbating factors such as poverty, injustice, discrimination or lack of awareness or dis-empowerment of women and girls, is the core of the GBV agenda. However, the UN preference for GBV linkages with developmental goals has meant that the politics of VAW has deflected or at least, diluted, the focus from the immediate perpetrators, purpose and benefits of violence. Instead, the GBV approach looks closer at socially constructed masculinity rather than material-based patriarchy, to be the direct motivation or cause of criminal intent behind such violence. Perversely, this is allowing generations of perpetrators to metaphorically but also literally, get away with murder. This is because GBV projects offer to rehabilitate masculinities, change the broader power structures, and improve the justice-education-health systems or gender relations in communities, rather than simply recognize the criminal and his immediate motivation. Nor do GBV projects sponsor punitive methods to address such violations. The recent attack on a 14 year old girl-activist, Malala Yousufzai, by the Tehreek e Taliban Pakistan (TTP) in Swat, Pakistan, has pushed the reset button on the momentum that was being gained by Gender-Based Violence (GBV). The Taliban’s attack may have inadvertently rescued the narrative of the VAW approach, which calls for more direct focus on immediate causes and perpetrators and more urgent responses to cases of violence against women. The range and multitude of the global response to the attempted assassination of Malala have been far-reaching. They span from Madonna’s puzzling bare-back tribute to the young activist at a concert just days after the attack, to the equally jingoistic decision by the government of Pakistan to name three of its Frontier Corps platoons, ‘Malalai’, ‘Shazia’ and ‘Kainat’, as a ‘tribute’ to all three school girls targeted and injured by the Taliban. While the case has received near-universal condemnation, various interests groups in Pakistan are competing to add to the multiple layers of ascribed motivations, causes and responsibilities. There is also much political mileage to be availed in view of the sweep of outrage and sympathy across the world. A virtual supermarket of ‘Blame’ brands are available for commentators ranging from American hegemony, imperialism, drone attacks and even, anti-Islam blasphemous material produced in the West. 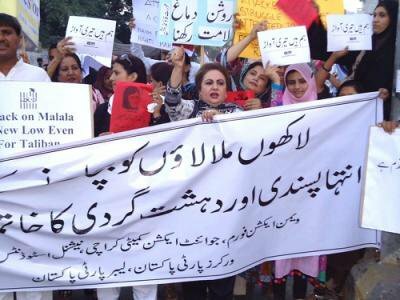 ''We demand the end of Extremism and Terrorism" - Protest in Pakistan byleft and women's groups. Photo: member of WAF. While GBV approaches link the low rate of literacy and abysmal indices for girls’ education in the country to gender based discrimination, the narrative that has spun around Malala’s case has thrown up a host of deeper, unresolved and critical issues with reference to violence. The Taliban have categorically reclaimed religious patriarchy as a deliberate base for the kind of violence it consciously employs. In several press releases, the Taliban spokesman has refuted all the defenses being spun by Islamists and conservatives (such as drone attacks), as the motivation behind the assassination attempt. The statements have impatiently corrected the rationalisations and confirmed that they attacked Malala specifically for her adversarial intent to “secularise society” by educating girls according to a non-Islamic curricula. Her aimed defiance to the Tehreek e Taliban Pakistan (TTP) qualifies her as anti-Islamic and the Taliban claim, “We did not attack her for raising voice for education. We targeted her for opposing mujahideen and their war”. The aim to kill her was the natural culmination of their larger campaign of systematically blowing up girls’ schools over the last five years, in northern Pakistan. For decades, women’s rights activists resisted the monopoly of violence claimed by the state, and unpacked the lease of this to men in communities who then target women with impunity under the guise of cultural practices and patriarchal traditions. Over the last two decades, with donor encouragement, several development practitioners became engaged with the idea of instrumentalising Islam as a tool for women’s empowerment. This premise allowed them to pursue the case for educating women and girls through religious didacticism. It also allowed for the co-option of clergy who resisted contraceptive use to become its promoters. Theoretically, it was thought that this strategy would counter what were labeled ‘anti-Islamic’ traditions that sanctioned violence against women. VAW proved far more resilient. What these activists underestimated was that instrumentalising Islam is not a parochial privilege limited to rights based activists. The Taliban and sympathetic Islamists do not doubt nor resist the need for women’s education as a Quranic prescription– just its nature, purpose and ‘secularising’ ends. The debate is shifting away and being reframed by all the actors involved and reconfiguring around notions of religious and secular forms of violence. As a result, the symbol of woman as a carrier of both the virus and cure, the seed of destruction and resurrection, war and peace, continues to serve as the barometer of Pakistan’s unresolved issue of Islamic vs secular options and pursuits. In the post War on Terror (WoT) period, incrementally, Pakistani women have been the direct targets of Islamic militancy. At first, activists struggled to decode the patriarchal impulses and gendered impact of a more generic conflict. By 2007, however, the Swat Taliban came to have virtual control over Swat. Girls’ schools were bombed, barbers and music shop owners were attacked, women warned not to come to the bazaars or hospitals or to leave their houses alone, and were assaulted when in violation of regulations. Women performers, called the ‘dancing girls of Swat’ were assaulted, and at least one, Shabana, was shot dead and her body hung on display at a crossing dubbed Khooni Chowk (Bloody Crossing) as a symbol of the Taliban’s regimen of moral cleansing. The use of women as a signpost is not exclusive to the Taliban but unlike in inter-community or inter-ethnic murders, Islamic militants leave messages to the state, government and citizens by literally pinning post-its to dead bodies routinely and systematically. So too, Shabana’s body was strewn with currency notes as a mocking reminder of the fate of those deemed un-Islamic (in her case, prostitutes) by the Taliban’s sharia rule. Unlike men of sub-nationalist movements or even mainstream Islamists, the Taliban are overt and unapologetic in their exploitative and symbolic use of the female body. Despite the self-confessed assassination attempt on Malala and repeated explanations of why they will continue such acts, the Islamists and conservatives in Pakistan have launched a counter-campaign to disassociate this crime (against Malala) from the criminal (the Taliban militant). The argument in the media spin that followed the targeted assassination attempt was that Malala had been attacked by an abstraction – American hegemony, imperialism, Islamic freedom, militancy, Westernisation, class aspirations, honour, nationalism, secularism, women’s rights. By not recognizing the self-confessed murderer, Islamists absolve the criminal and dissolve the crime. Such unprecedented violence has diverted attention and hindered the struggle of women and human rights activists who were more committed to normative and routine public and private cases of VAW. Activism meant rescuing women under threat, offering legal assistance and providing shelter as well as, pressurizing the state and justice system to deal with the perpetrators. Even as we observed the course of the 'war on terror' and its fall-out in Pakistan, the growth of GBV projects continued to divert the emphasis away from direct action and towards developmental and rehabilitative approaches. Islamic militants such as the TTP have directly challenged all apologia that argues that they are victims of some misguided masculinities, brutalized by tribal war and poverty. Neither do they view themselves as jihadi proxies used and discarded by the Pakistani state, or as citizens who are denied justice. They do however agree with some sympathisers who continue to view the Taliban as products and resistance armies of US anti-imperialism. Is it viable to continue viewing the conscious agent as a victim? To deflect the direct responsibility of a crime away from the individual and place it on the breadth of society, government, the state, global powers or imperialism, then empties the perpetrator of criminal motivation and refills him with a higher, larger-than-life, mission. The creation of such noblesse oblige is done by converting the agent into a victim. This laundering opens a new line of defense. It suggests (as several Islamists have done) that, under certain circumstances, a case of justifiable homicide may be made. However, in the views of the same sympathisers, this flexibility is a limited moral commodity. The defense of a higher moral purpose as the motivation for murder is not a universally available tool for all citizens regardless of class, creed or gender. It is a selective application reserved only for those who are deemed Islamic enough and soaked in the cause of promoting/defending Islam as defined by powerful or political clergymen. In other words, Malala may be worthy of sympathy due to her status as a minor but does not qualify for justice because of her near-fitna (seductive, luring, chaotic) activities. In the minds of these apologists, her would-be assassins were absolved of their crime even before they were caught, despite their stated motivation (which has not been cited as the drone attacks but due to Malala’s adversarial intent to secularise her society) and even prior to a judicial hearing. In such a world-view, justice must not be blind but dependent on the perceived beliefs or religious weightage of the individuals or parties involved. One of the complaints made by proponents of the Taliban-as-victim group, is that violations against women by secular landed politicians, do not receive as much media attention or outraged response. This is a completely dishonest proposal. The case that is often quoted as ‘exaggerated’ or ‘sensationalised’ to expose the Taliban’s Islamic justice system following the peace deal with the government in 2009, is that of a woman flogged by Taliban ‘police’ in the streets of Swat. The mobile phone amateur video went viral on national and international channels. In 2008, soon after the new incumbent civilian government was installed, two high profile cases involving the landed politicians of the ruling party were equally ‘sensationally’ splashed across the media. With reference to one of these cases of the alleged ‘live burial’ of girls who refused their arranged marriages, Pakistani women’s groups lobbied, protested and came on TV channels demanding the removal of the cabinet minister from the said constituency. They did so, in protest of his defense of such ‘traditions’, which he offered as a justification for this crime. To suggest that religious militancy is the only crime that is picked up by the media or liberal groups is an intellectually dishonest claim. The spectacle of the flogging caught on video made the case more visual and hence caused more outrage than the other cases. This defensiveness stems from a more common refrain used by the apologists of Islamists’ politics of violence – that secular political forces are no better. Feminists, including myself, have persistently made this critique of not only liberal, secular men, but also of the state, as abusers of the political potential of women’s bodies and also because their acts sanction a regulation of women’s sexuality and all its manifestation. However, the Malala case falls outside of this framework. The concern of the Taliban in this case was not to regulate the girls’ sexualities (although it may be elsewhere), nor to accrue material benefit, nor revenge for drones and nor was the purpose to restore ‘honour’, as some communities employ this motivational excuse in cases of VAW. In these non-theocratic cases, perhaps the GBV framework is a useful one. However, the Taliban are not hiding behind socio-economic or tradition based excuses. It is time for analysts to recognise the self-acclaimed agency of the perpetrators and clearly identify the victim in cases of VAW, rather than defend the criminal as victim and dissolve the crime as an abstraction. The TTP has reminded us of the simple core of VAW and reiterated what feminists always knew - VAW removes any threat that the liberationist ‘Woman’ may pose to the religio-patriarchal social order. If eliminating girls’ schools does not do the job, then a stronger signal of directly removing all agents (women/girls), should secure the message for those who may be harbouring plans to disrupt the Islamic order they seek to impose. Foreign donors scramble to rebuild schools, and the state attempts to resist militancy by giving symbolic significance to the services and resilience of girls such as Malala, in order to boost their public relations campaign in the fight against militancy in north Pakistan. Meanwhile, the Taliban have recovered the simple lesson of success achieved by direct action, and the symbolic value and immense ideological success available through the act of removing the obstacle. Will we?